If you live in San Francisco, you're used to walking -- often uphill. Given its dense population and small area, San Francisco is America's second most walkable city, behind New York City. According to Walk Score, the company that calculates walkability, bikability and transit accessibility across the U.S., 45 of San Francisco's neighborhoods are "Walker's Paradises," which means that daily errands don't require a vehicle. But as the city continues to add new bike lanes, transit routes and sidewalks, other neighborhoods are quickly playing catch-up. We checked in with Walk Score to find out which San Francisco neighborhoods showed the biggest gains for walking, biking, and transit accessibility between 2016 and 2017--and which saw a decline. Before we get into which neighborhoods boosted their scores and which slipped, it's important to understand how Walk Score calculates its ratings. They're based on walking distance to amenities across seven broad categories -- dining and drinking, groceries, shopping, errands, parks, schools, and culture and entertainment. Each category is weighted differently, and the company also looks at average walk length and intersection density, to calculate pedestrian-friendliness. The maximum number of points (out of 100) are awarded for destinations within about a quarter-mile -- no more than a five-minute walk -- of a particular amenity. Fewer points are awarded for amenities farther away, with zero points given for amenities more than a mile and a half away. All of that information is then put through Walk Score's proprietary algorithms, which in turn spit out a number value. The sum of those values is the Walk Score. You can see those elements play out in the real-life scores. With a Walk Score of 99.97, San Francisco's most walkable neighborhood is Chinatown, which teems with shopping, restaurant and school options. The similarly amenity-filled downtown/Union Square area comes in second, scoring 99.41. An important factor to any Walk Score is what Walk Score spokesperson Aleisha Jacobson calls "depth of choice." "In each category, having more options is better than having fewer," she said. For example, having two grocery stores is better than having one grocery store, and having five neighborhood restaurants will produce a higher score than three. What causes a neighborhood's Walk Score to jump? According to Jacobson, it's a combination of factors. "There are definitely neighborhoods that are making bigger jumps because cities are actively working to promote walkability and density," Jacobson said. "They're investing in neighborhood revitalization and planning communities around transit areas." 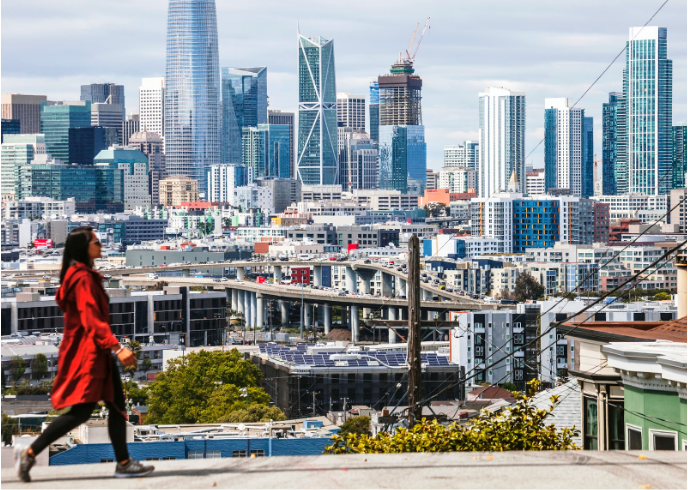 When it comes to which San Francisco neighborhoods grew this year, the results aren't surprising: three of the top five are in the city's southeastern quadrant, where major building developments are underway. On the flipside, there are neighborhoods that saw a big Walk Score dip. According to Jacobson, this usually isn't attributable to small factors like one or two businesses closing--although when a school or grocery store closes, that has a larger impact than when, say, a restaurant shutters. "One or two businesses isn't going to cause the neighborhood score to drop drastically," Jacobson said. "It tends to be a broader trend in a neighborhood as a whole." If your neighborhood saw its score decline, don't fret. Even though some neighborhoods see a dip in their Walk Scores from one year to the next, Jacobson says that the larger trend across the country is that walkability is on the rise. "We have broadly seen walkability increasing in most cities and in most neighborhoods across the country," Jacobson said. "Generally, the trend is for areas to become more walkable." Want to check out your residence's Walk Score or see how your neighborhood stacks up to San Francisco's other enclaves? Plug in your address here.